Cook pasta in boiling water for 9 minutes. Drain and cool on a sheet pan. Set aside. Mix together the Ricotta, Mascarpone, half the Parmigiano, half the Mozzarella, parsley, salt and pepper. Fill the shells. Grease a 9 x 13-inch baking dish; add half the sauce. 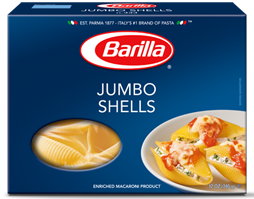 Arrange the shells (opening up), cover with the remaining sauce, Mozzarella and Parmigiano. Bake covered in the oven for 30 minutes.